Ever since I first heard of the glory that is the Cuban sandwich, I knew I had to try one. They don’t seem overly common on restaurant menus here in Arizona, so I was up to the challenge to create my own, just so I could finally experience one for myself. It now ranks as one of my favorite sandwiches I’ve ever eaten! Traditionally, a Cuban sandwich starts with a particular type of bread, a white sandwich bread made with the addition of lard. I’m sure the internet is packed with recipes for true Cuban bread, but I felt like improvising with a loaf of unsliced white Italian bread, with a soft crust. Feel free to use any sort of soft-crusted white bread, just so long as you don’t use something like a baguette. Crunchy, hard crust will be no bueno. From there, the bread gets layered with yellow mustard, dill pickles, swiss cheese, ham, and sliced roasted pork. I decided to whip up a batch of my favorite pork carnitas to sub for the sliced pork, and it is more than amazing in this sandwich! All that’s left is to butter your bread, and fry it up until the cheese is melty and the bread is crisp and browned. Make it happen! Preheat your oven to 275 degrees. Using a sharp knife, remove the exterior cap of fat, and the shiny membrane, from the pork. Cut the meat into 2 inch wide strips, and then each strip into 2 inch cubes. Toss the meat in a bowl with the salt, red pepper flakes, cumin, and oregano. Place the seasoned meat into a 9 x 13 inch baking dish, packing the meat in tightly into a single flat layer. Squeeze the quartered orange over the meat and nestle the oranges throughout the meat, and do the same with the quartered onion pieces and the garlic cloves. Pour the oil evenly over the meat and cover the pan tightly with foil. Pop into the oven and cook for 3 1/2 hours. Yes it’s a long time, and yes, it will be worth it! Once the meat is cooked, remove the foil from the pan. Fish out the onions and oranges and discard them. Place a large colander over a larger bowl and pour the entire contents of the pan into the colander, letting all the liquid drain out. Put the meat back in the pan and pour the liquid into a large measuring cup, or a fat separator if you have one, and let the fat rise to the surface. Skim off any fat and mix it back in with the cooked pork. 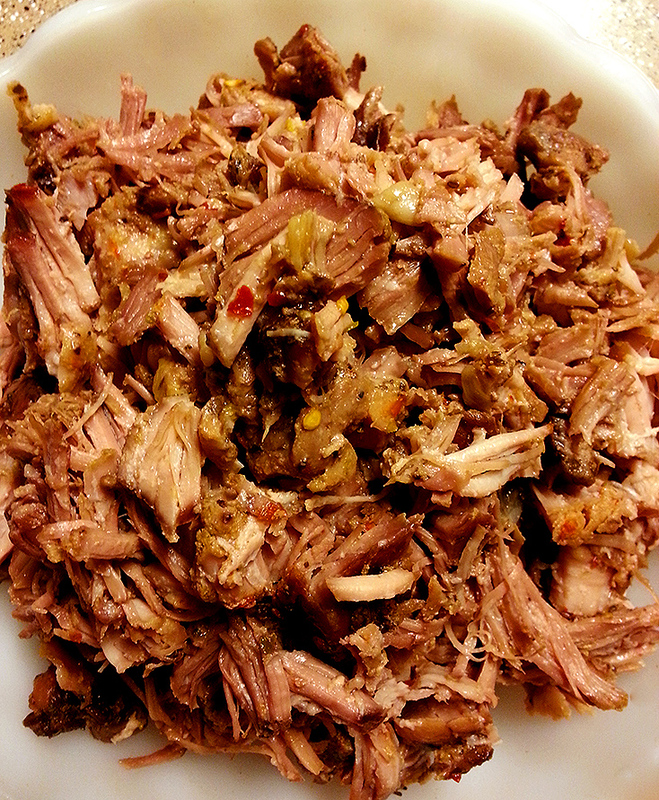 Shred the pork into smallish pieces. Once you’re ready to assemble and fry the sandwiches, grab all your other sandwich fixings. To build each sandwich, cut the sliced bread loaf in half to make two sandwiches. Spread each piece of bread with 2 tablespoons of mustard, and top each piece of bread with 1 oz of swiss cheese. Place some pickle chips on one side of each sandwich, and top the pickles with 2 oz of sliced ham. Top the ham with 4 oz of the shredded pork. Place the other cheese-covered half of sandwich on top of the pork and press down to flatten the bread slightly. Heat a skillet over low-medium heat and brush both sides of one sandwich generously with melted butter. Place in the preheated skillet and press down with a small plate or a hefty spatula briefly to further smash the bread. Let the sandwich fry for 5 minutes, then flip over, smash again, and cook for another 5 minutes. You should now have a sandwich that’s crunchy on the outside, and melty and hot on the inside. Cut it in half diagonally and serve it with some tortilla chips and maybe a side of salsa, and call it lunch or dinner! To keep the remaining roast pork, store in an airtight container in the fridge for up to 3 days. If you want to use it for something other than a Cuban sandwich, it is excellent in scrambled eggs, turned into corn tortilla-wrapped tacos with some cotija cheese, avocado, and red onion, or just eaten by itself. Trust me, it’s that good. I hope you’ve all enjoyed this year’s National Sandwich Month, cause I know I did! I’ll be taking next weekend off, but expect some tasty sweets coming up in September!